The Wen models have their own hair stylists 24/7 at the Chaz Dean Hair Studio in California; hence, their hair always looks phenomenal; whereas we, the regular “chicks” must work a bit harder to achieve results. We do have one huge advantage over those models, our self-confidence and creative skills to guide us through the process. I have been a Wen Girl since February 2009; however, truth be told, it took me six months to a year before finding my niche (the right formula); hence, like the fairytale, sometimes we must kiss many frogs before finding our prince. Whether you use one Wen Formula or, combine with more than one formula, the Wen Hair Care System is JUST that – a “system” and must be followed to the letter in order to achieve the desired results. While Wen suggests “the more product the better the results”, I found that less is more; hence, begin with the minimum amount of pumps and work your way up, until you find the amount that works for you. 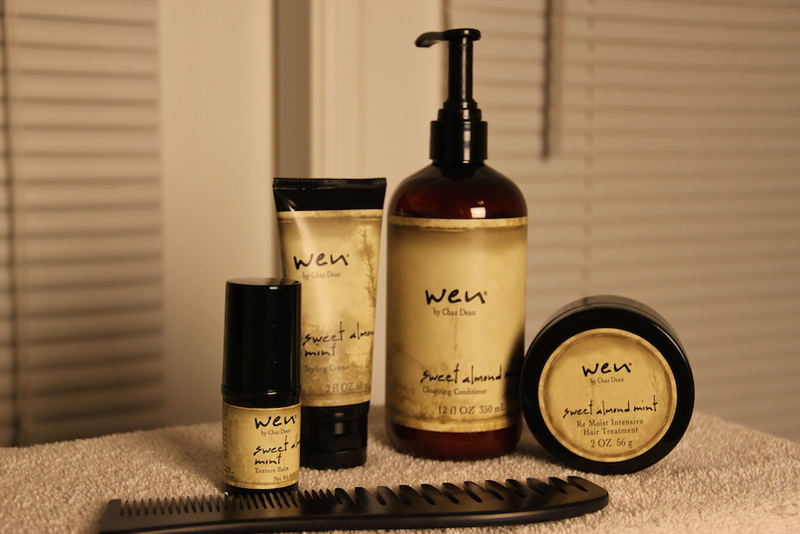 Note that the comb-through is the secret to the Wen System. Sweet Almond Mint and Pomegranate are universal, offer shine and strength. Both these formulas will add love to the crowning glory already blessed with body and volume. Cucumber Aloe is intended for oily scalp, fine hair. A great astringent, clarifying “deep-down” clean for removing buildup; will not strip color-treated hair. This formula offers body/volume, plus holds a style forever but offers limited hydration; hence, the suggested use for fine hair: bi-monthly for a deep-down clean. Lavender is as smooth and silky as its name. This puppy offers mega body and volume for dry, flat hair. It contains botanical oils which stimulate the scalp and promotes hair growth. For my fine, medium length hair, Lavender “rules”; gives my hair the body and volume it craves; hence, Lavender Cleansing is my hair’s core and “soul-mate”. Tea Tree is for scalp issues but also works great for creating fuller hair. Bamboo Green Tea lends radiant shine, elasticity and body to fine hair. This pup is my second favorite; I combine it with Lavender Cleansing. The results are phenomenal. Currently, the Wen buzz is about mixing formulas to achieve even greater results. By mixing formulas, you use a number of pumps from each bottle, depending how many Wen Cleansing formulas you own. In 2013, Tree Tea received rave reviews. It is specifically made for scalp issues but also universal. I combined it with the Lavender Cleansing. My hair had body, volume and felt as though I had actually grown more hair. YAY! A few months later, Chaz created another beautiful monster called, Bamboo Green Tea – promised radiant shine, elasticity and volume – Bingo! Again, exactly what I needed; however, I took it to the next level – used 1 pump of Bamboo Green Tea and 3 pumps of Lavender Cleansing. The results were phenomenal. Three pumps Lavender Cleaning and 1 pump Bamboo Green Tea; rub in the palms of your hands to distribute evenly, first work the crown; repeat the four pumps to the nape; then the left side (mid-shaft) down through the hair into the ends; to the right side (mid-shaft), down through the hair into the ends. Using the Wen Wide-tooth comb, comb through from the crown to the ends, using the wide tooth to untangle the hair and the smaller teeth to smooth and evenly distribute through the hair. Clip hair up and leave in for 3 minutes while finishing your shower. The total amount of pumps would be 20; hence, use 10 pumps for the first cleansing to loosen dirt and debris, rinse thoroughly, then use 10 pumps to cleanse the hair, add a splash of water to create a creamy effect, comb through to evenly distribute, then clip the hair up; leave in 3 minutes while finishing your shower. Rinse with cool water. The hair absorbs only what it needs; the rest goes down into the drain, literally. After rinsing, shut down the shower, apply half a pump of Lavender Cleansing which is also conditioner, in the palm of your hands and rub together as you would hand lotion, then apply to the left side (at mid-shaft) of absolutely soaking hair, work through to the ends; repeat and do the same to the right side (mid-shaft); then whatever is left on your hand, work through the crown and down the back to the ends; comb through, using the wide-tooth to untangle and the small tooth to smooth the hair. Lastly, apply small amount (the size of a pea) of Cucumber Aloe Styling Crème and repeat the same process as done with the Lavender Cleansing (conditioning). My personal preference is the Cucumber Aloe Styling Crème since it locks in the style better than the other Wen Styling Crèmes. Please Note: The Cucumber Aloe Styling Crème should be worked into the hair but avoid touching the scalp. After completing the entire process, reach for the double-sheet of paper toweling and squeeze the excess water from your hair. This reduces frizz. Continue to remove excess moisture with a towel and wrap the towel loosely around your hair while drying off. Blot hair dry. Do not rub hair – rubbing creates frizz. While hair is still damp, blow-dry into style and you are ready for the day or, the evening. Wen is an ongoing experience and experiment. While the single formula works fine, mixing formulas is the ultimate way to boost your hair’s health and enhance the shine. It’s all about the hair, your crowning glory. Wen is revolutionary. Try it once and you will never go back to ordinary shampoo. Yes, it costs a bit more but given the time and money spent at the Hair Salon, Wen is worth the price and, most importantly, you and your hair are worth it.